We LOVE Priscilla Putman! She makes it easy. She is a hardworking momma with a passion to teach young and ‘old’ alike. 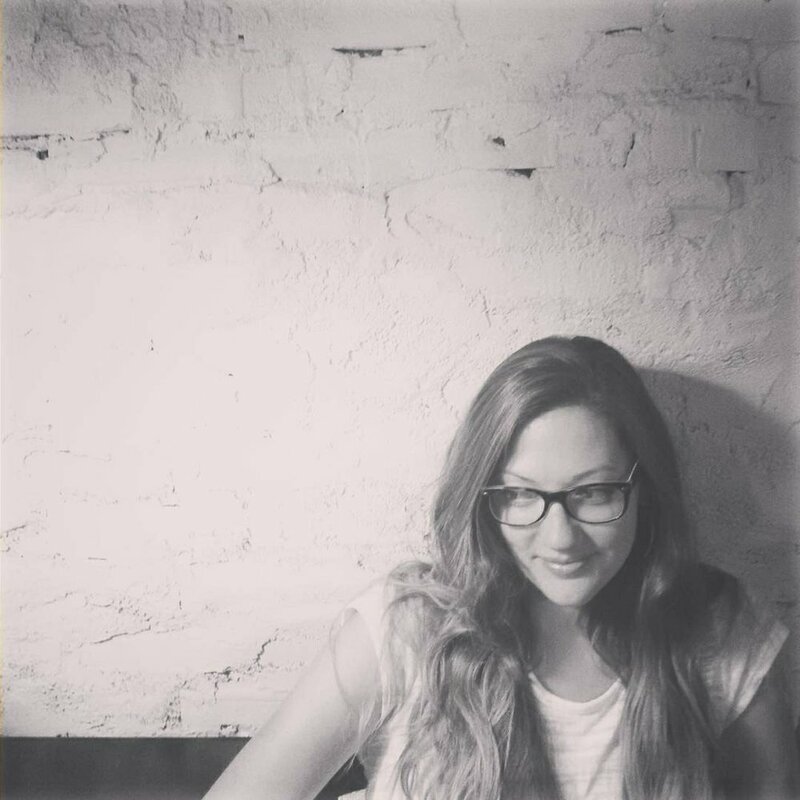 Priscilla will be back at The Hop this Friday teaching her SOLD OUT Brush Lettering Workshop. 1. Tell us about Simple Palette and how it came to be. The Simple Palette is a hand lettered paper goods + gifts company owned and operated by yours truly, right here in Champaign, IL! As an artist and art teacher I have always loved calligraphy and hand lettering, but it was about 3 years ago that I created my first line of watercolor and hand-lettered greeting cards for an art show - and was immediately hooked! I opened an Etsy shop online with only a few cards and slowly began to add new designs over the last three years. I fell in love with the process of creating whimsical and playful watercolor illustrations and pairing them with hand lettered phrases - from food puns to heartfelt quotes - to create unique and meaningful cards and gifts to share with loved ones. I am a gift giver at heart - in fact, many of my designs are inspired by someone special in my life - so it always brings me joy when I can help someone find a meaningful gift for their own loved one! After creating my original designs by hand, I work with local printers to produce my stationery, art prints and tea towel designs in small batches - then package everything with love in my home studio! You can find my work online at www.thesimplepalette.etsy.com, or at local art markets throughout the year. 2. As a teacher, mom, and artist, what does community mean to you and how does it affect your business? Community inspires nearly every aspect of my life. As an artist, the artwork and gifts I design are created for the purpose of reaching out to others - for walking beside someone who is going through a difficult time by sending a thoughtful card, or celebrating life's joys with one another with a gift that brings a smile. I don't believe we were meant to "do life" alone. We need each other! I am always trying to extend this sentiment to my role as an art teacher. Every year I do an art project with my students where we hand-letter a quote that would encourage and uplift our school community, and we hang up the finished prints all over school! I've lived here for almost 10 years, but in the last few years as a mother and small business owner I have become especially aware of what it means to truly be a part of our community here in Champaign-Urbana. Little things like supporting local artists and makers, and shopping at the Farmers Market whenever we can for local produce can make a big impact, and teach our children about the inner-workings of a sustainable community. I make a point to produce and create products for The Simple Palette locally - putting money back into other locally owned businesses, and ultimately investing in my own community! 3. Can you tell us about the class you are teaching? 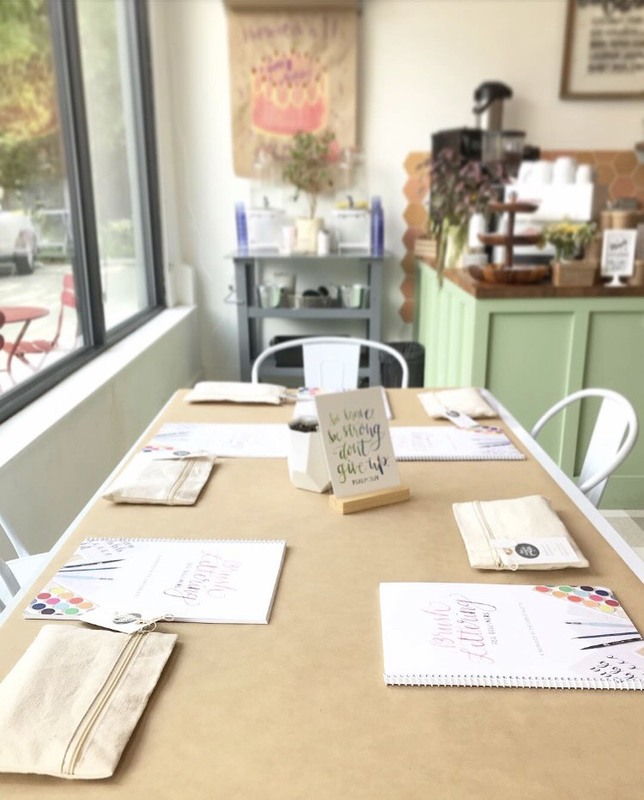 In addition to paper goods and gifts, The Simple Palette is now offering brush lettering workshops! 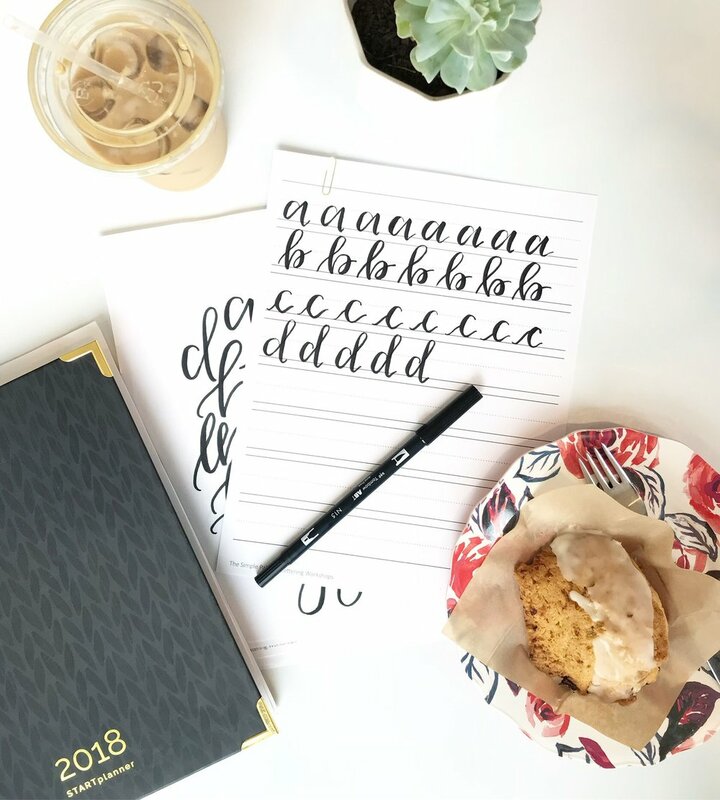 It's the perfect combination of my love for teaching and brush lettering - and I am so excited to teach a class here at Hopscotch! I created a brush lettering practice book especially for our workshops - filled with tips and tricks for using both brush pens and watercolors to letter. I also hand selected lettering tools and materials for the class that I use almost every time I letter. Each attendee with get a copy of my book to keep, as well as a kit that has everything you need to start your own journey with brush lettering! This class is for beginners - for students who have the interest but aren't quite sure where to start or what supplies they would need. We start the class learning lettering with brush pen markers and then end the class by using a specialty watercolor brush and learning how to mix up watercolors in our palettes to approach lettering in a more painterly way. For this class we will also try out our new skills lettering names on watercolor place-cards and gift tags, just in time for the holidays! 4. What is your favorite goodie at the shop? My favorite treat would have to be the scones - hands down - paired with a vanilla latte of course!